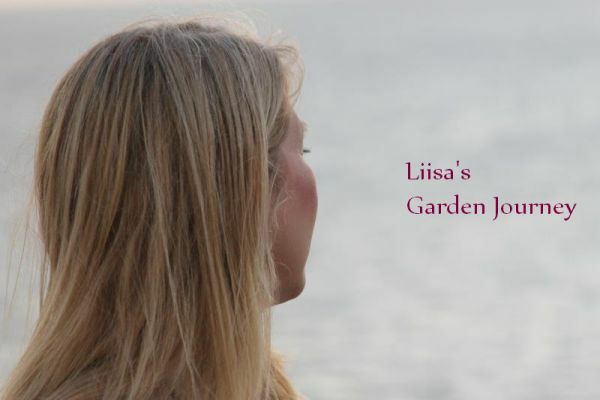 After spending Saturday morning at the Haven garden (see post before this one) I needed to get working on my own garden. It seems this time last year I had a lot more already planted out in the garden. It's probably a good thing I'm a bit behind since winter is holding out until the bitter end. It's been much cooler this year than it was last year. I repotted bell peppers, summer and winter squash, more cucumbers, and one more tomato. Photo below: Some of the pumpkins will be ready to pot up this next weekend. 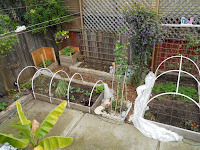 Photo below: The tomatoes and cucumbers are looking very healthy. Photo below: All the seedlings I have started so far. 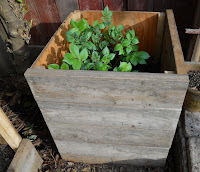 I'll be starting bush and pole beans in a week or two. Photo below: I added the last board to the mid season potato bin. They are growing so fast. Photo below: Spinach sprouting in bed 4. 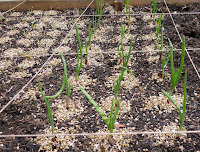 Photo Below Onions sprouting in bed 4. Sunday was a good day to do a little pre spring cleaning on the patio. The potted plants in the beds next to the window needed to be cleaned up. I repotted a few plants that were root bound and added soil to others and gave every thing a good watering. Photos below: Patio before and after photos. 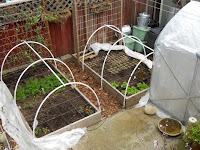 Once the greenhouse comes down in April I'll be able to move most of the pots next to the garage and get the patio furniture out again. After all this work over the weekend on my way home from work today it starts to hail and we are going to have frost in the morning. 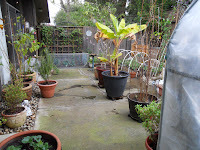 So I had to move the banana into the greenhouse and the rest of the pots on the patio were moved under the eave. The potatoes were also covered. Like I said, old man Winter is holding on to the bitter end!